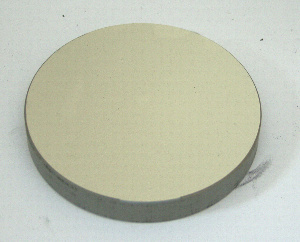 TAL-1 guide but can be applied to any Newtonian refelector that needs mirror cleaning. The basics of mirror cleaning...... 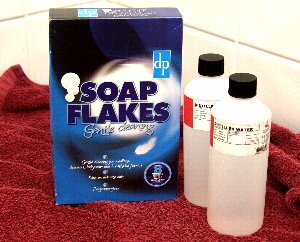 Some pure soap flakes and distilled water. Distilled water can be acquired from many on-line sources as well as any good pharmacist. 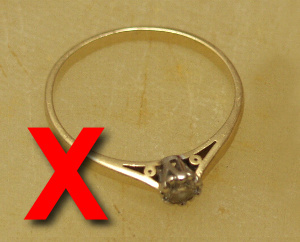 Before handling optics make certain any jewelry is removed such as rings, wrist watches etc. These can easily do irreparable damage to the telescopes optical glass. Here is the primary mirror as removed from the telescope in an earlier stage of rebuilding. A small amount of soap flakes (check the manufacturers guide) are added to hot water and mixed well until the water is foamy. Cool the water down to luke warm for the mirror and.... ...gently place the mirror in the water and leave it for about 10-15 minutes. Agitate the water periodically. For stubborn marks you may need to brush the mirror lightly - I prefer to use my hands once they are water softened and clean and slick with soap. Some people prefer to use surgical cotton wool. 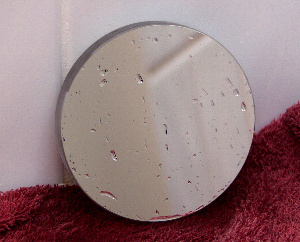 Now place the mirror on a slightly sloping surface and wash away the soap suds and water using distilled water. The mirror is now stood up to dry in a warm environment. DO not use a heat dryer or hair dryer. The distilled water if left to dry will not leave any streaks or marks. 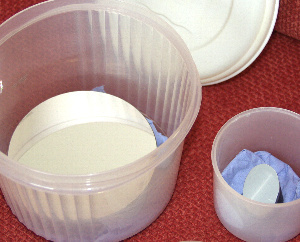 Finally, once fully dry, the mirror is stored in an airtight container and placed on some acid and bleach free paper. The secondary mirror can be treated the same way but DON'T leave it in the water. 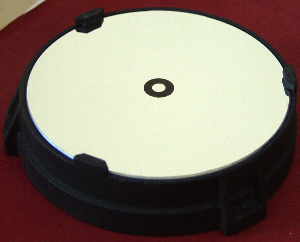 Some manufacturers will have used a glue to hold the secondary to its mounting which may be affected by water. I prefer to agitate the secondary about in the water rather than just leave it to soak. To create a centre spot for collimation you will need to prepare a spot. I used some hole reinforcers used for filing. These are available from any stationary store. These were blackened using an indelible marker. Let the ink on this thoroughly dry. Next you will need a mirror spotting template. 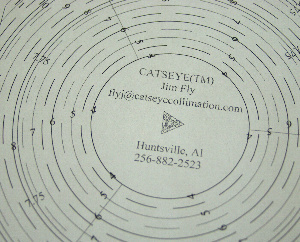 I used one downloaded from the Catseye Collimation site (www.catseyecollimation.com) and printed it onto a transparent sheet. 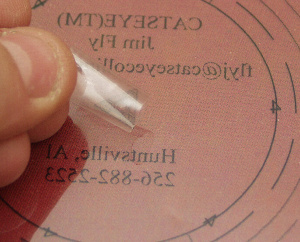 The template needs to be the same size as the mirror and with its centre marked. 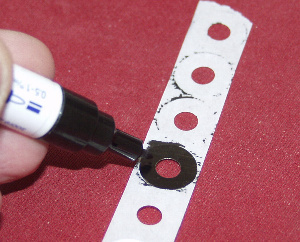 Make a small roll of low tack tape or sellotape that's been handled a bit to remove its stickiness and place this onto the template at its centre. Now apply the collimation ring you made earlier so that its black face is towards the stick tape and its sticky side is facing upwards. This is what your template should look like at this stage. On the bottom of the template (the side towards the mirror) you have a small strip of sticky tape holding on to the collimation spot which has its sticky side also facing the mirror. Note the sticky tape in this picture is larger than you would use. 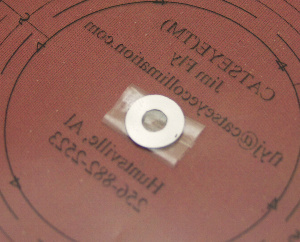 Ideally you use a piece of tape that's smaller than the collimation spot. Now place the template over the mirror. Its a good idea to have a dry run without the tape or collimation spot just to check all is well and you know where you are aligning to. In this picture the mirror is already in a mirror cell - its easier with the mirror removed which is how this one was done. Note:During the original spotting process the camera packed up and we had no pictures so this is just a dummy run to give you the idea. Press the centre of the template lightly and the gently remove it. 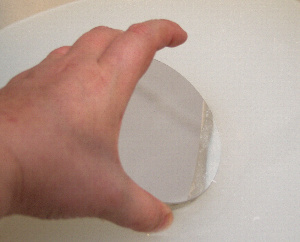 It should leave the collimation spot on the mirror which can be pressed down gently with a cotton bud if need be to get a better adhesion to the mirror surface. The final outcome....the mirror is spotted to its physical centre and your ready to reinstall the mirror into its cell and into the telescope.